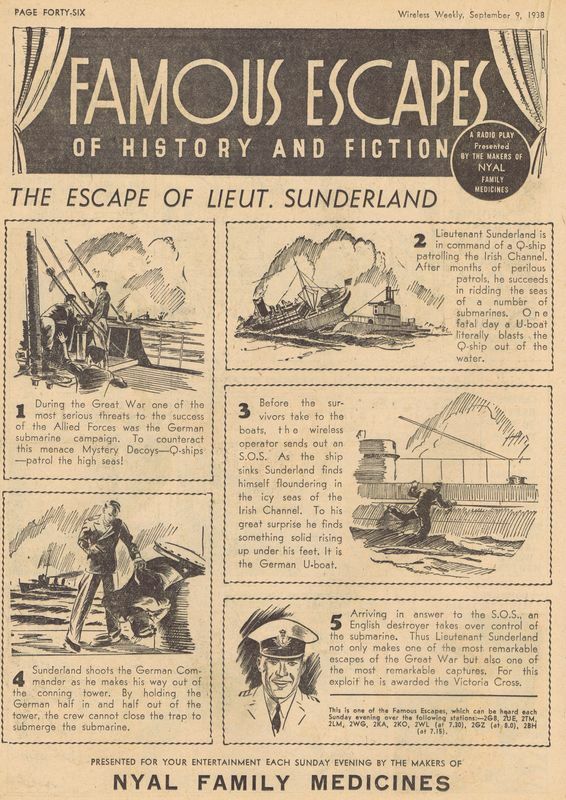 It was interesting to find that Wireless Weekly presented a pictorial account of some of the 'Famous Escapes'. These were included in the September, 1938 issues of Wireless Weekly. Many series were associated with comic strips, but this is the only graphical series of this kind that I can think of. Certainly the sponsor 'Nyal' made use of the association with this series. Nationally sponsored by Nyal Commenced 16th January 1938. Cast: Leonard Bennett, Ronald Morse, Peter Finch, Lou Vernon, Betty Suttor, Barbara Smith, Harold B. Meade, Frank Bradley, Leslie Victor, Harvey Adams and Mary McGregor. A complete log has so far been difficult. Going through the program guides in Sydney, Melbourne, Brisbane, Adelaide and Hobart, I found that the series was broadcast out of order in every state. Collectors with Transcriptions indicate no titles were displayed on the labels and no indication was given in the introduction of each episode. This has meant that names allocated by collectors differ. Artransa rereleased the series in the 1940's and it looks like they also changed the order of episodes. They exported the series to the U.S. and again may well have changed the order or naming. For the reasons I have mentioned, I decided to base the main log on the original scripts. Some scripts listed on NFSA database do not have names allocated and those I have since received advice from NFSA with names after they pulled the scripts for me. Because the episodes were broadcast in a different order from the scripts from day one, I have also added a log taken from the order in the program guides for Australia. It is worth noting that Wireless Weekly magazines in September 1938 contained full page drawings and captions telling the story of that weeks episode of Famous Escapes. To my way of thinking, for documentation purposes, we should name and number the surviving episodes in the order of the scripts but note the broadcast order in the documentation as well. Strangest log I have had to work on so far. ep04 The Escape of The Kelly Gang. ep03 Mr Poulton. There is no record in the program guides or newspaper articles of this episode being broadcast. A staff member from NFSA wrote the following description from her reading of the script. "Looking at the Mr Poulton episode, he is an accountant and only has a couple of lines. I think the title is wrong. The main story is around Jim and Arthur who own a garage. Mr Poulton recommends they need investment of 500 pounds to make improvements. Jim wants to marry Betty Poulton, the daughter of Mr Poulton. He knows his friend Hubert Collins has just come into some money and asks him if he wants to invest. Hubert agrees on the proviso they all take out life insurance premiums. Hubert asks Betty to marry him and Betty agrees. Profits increase but Jim and Arthur start to resent having to split the profits three ways instead of two. They discuss possible ways Hubert could have an "accident" in the garage. They hit Hubert in the head and place him near the exhaust of a running car, hoping the carbon dioxide will kill him. Betty comes to meet Hubert for dinner and discovers him before it is too late. Once Hubert recovers he doesn't report them to the police, just removes his initial investment and he and Betty live happily ever after in another part of England.....And so concludes the escape of Hubert Collins." Mr Poulton or Hubert Collins, no matter the name, we do not have this episode nor is there an episode in the program guides that is not covered by the titles in the series. Its a mystery at this stage. ep14 Escape of Mary Queen of Scots. The scripts for episodes 14, 18, 24 are missing and I have placed Mary Queen of Scots in this position only as a guess. But the three could possibly exchange episode numbers, we will not know until one, two or all three scripts are found. ep18 The Escape of Harvey Jones. As above explanation. ep24 The French aristocrat. As above explanation. ep31 The Escape of Lord Cochrane. The script title was incomplete and missed the name of the subject, however Amanda McCormack read the script and Lord Cochrane was named, as was confirmed by the performance itself. Log completed by Ian Grieve using NFSA script listing, newspapers and magazines in my collection containing articles, program guides as well as advertisements for individual episodes and the series as a whole, as well as those available online. Assistance from NFSA was greatly appreciated.